Five months after putting Italy on downgrade watch, Moody's has seen enough and cut Italy's debt rating to Baa3 - one notch above junk status. Moody's Investors Service has today downgraded the Government of Italy's local and foreign-currency issuer ratings to Baa3 from Baa2. The outlook on the rating has been changed to stable, meaning that any downgrade to junk - the worst case scenario - has been taken off the table for the time being. Moody's also downgraded to Baa3 from Baa2 the local and foreign-currency senior unsecured bond ratings. The foreign-currency senior unsecured shelf and MTN ratings were downgraded to (P)Baa3 from (P)Baa2. Italy's local-currency commercial paper rating and foreign-currency other short-term rating were downgraded to P-3/(P)P-3 from P-2/(P)P-2. The rating outlook is stable. 1. A material weakening in Italy's fiscal strength, with the government targeting higher budget deficits for the coming years than Moody's previously assumed. Italy's public debt ratio will likely stabilize close to the current 130% of GDP in the coming years, rather than start trending down as previously expected by Moody's. Moreover, the public debt trend is vulnerable to weaker economic growth prospects, which would see the public debt ratio rise further from its already elevated level. 2. The negative implications for medium-term growth of the stalling of plans for structural economic and fiscal reforms. In Moody's view, the government's fiscal and economic policy plans do not comprise a coherent agenda of reforms that will address Italy's sub-par growth performance on a sustained basis. Following a temporary lift to growth due to the expansionary fiscal policy, the rating agency expects growth to fall back to its trend rate of around 1%. Even in the near term, Moody's believes that the fiscal stimulus will provide a more limited boost to growth than the government assumes. The stable outlook reflects the broadly balanced risk at the Baa3 rating level. In Moody's view, Italy still exhibits important credit strengths that balance the weakening fiscal prospects. These strengths include a very large and diversified economy, a solid external position with substantial current account surpluses and a near balanced international investment position. Italian households have high wealth levels, an important buffer against future shocks and also a potentially substantial source of funding for the government. 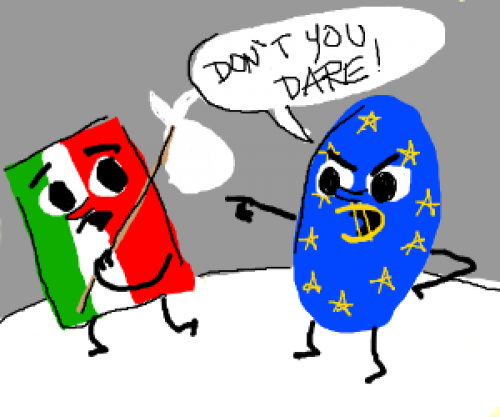 As a reminder, there is some risk that either S&P or Moody's or both rating agencies can further downgrade Italy's credit rating later today, although if DBRS retains its BBB anchor investment grade until 2019, at least Italian collateral will remain eligible for ECB purposes. 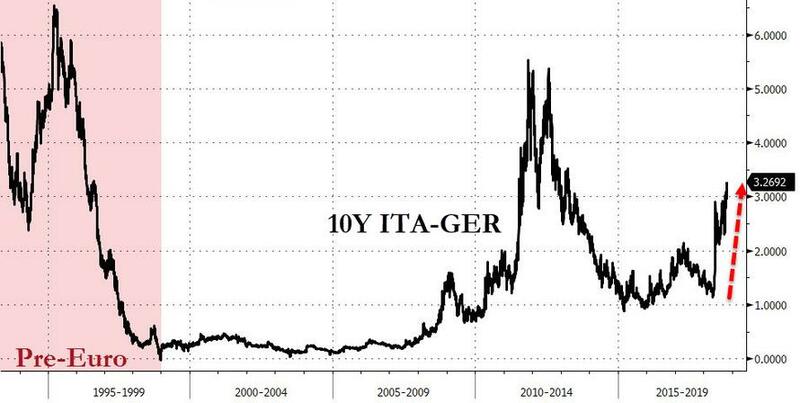 So while BTP/Bund spreads will likely widen in the event of a downgrade, Cignarella notes not to expect any haircut from the ECB. That said, watch Italian bank CDS: "holding falling securities will likely weigh on the banks' credit quality, raising their borrowing costs."